Writing iOS or Cocoa apps does require a Mac with XCode, but you can learn Objective-C (and work on libraries and command-line apps) on Microsoft Windows. GCC includes an Objective-C compiler. You can install GCC on Windows via Cygwin or MinGW. You can also get the GNUStep implementation of the OpenStep libraries which includes the same core libraries as Cocoa — including Foundation which contains NSString, etc. GNUstep includes a graphical environment GWorkspace which is a clone of the NeXT workspace manager. I haven’t gotten GWorkspace (or Backbone and alternative) to work on Windows or any other graphical apps, but you can use graphical GNUstep apps on Linux. What this means is that the core libraries and command line apps can work on Windows — which is good for learning basic Objective-C concepts. In order to use GNUstep on Windows install the GNUstep MSYS System — which gives you the core unix-like tools you know and love. Next install GNUStep Core. You should be able to open a Shell window and execute commands. Then install GNUStep Devel which will give you GCC with Objective-C and the GNUStep libraries which allow development. Gorm is an interface builder for GNUStep which allows you to create (admittedly ugly) GNUstep user interfaces via drag and drop — but I couldn’t get it to work on Windows. 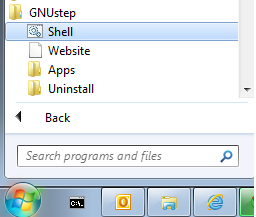 Once you have MSYS, GNUStep Core, and GNUStep Devel, launch the shell from your Windows Start menu. Voila, you’re coding in Objective-C on Windows with GCC! You can see that your managing memory the old fashioned way. You don’t have ARC, but you can get modern features using clang which is the compiler used by XCode. // FIXME: temporary hack: hard-coded paths. Now, using a plain text editor (even Sublime Text) for writing code isn’t always fun..But you can use Eclipse. I haven’t yet gotten Objective-C to compile with Eclipse CD% yet but I’ll post more when I’ve got it working. Can you provide more details about EclipseCDT(CDT 8.2.0 for Eclipse Kepler)+Gnustep and odj-c examples on it…. and does it really works..?? I m occupied to teach ObjC & iOS in an advanced Germany so I need an environment preferably indipendent of an Apple plattform as possible. And if you will make it to install other mentioned components plaese publish and let me know. Thanks. Glad you’ve found it useful. Hi, Aaron, i ve done everything you mentioned above but i encountered a difficulty when i was trying to run a code on clang. You can also consider using a virtual machine with linux on it.